The Jim Dunlop GCB95 Original Crybaby Wah Wah pedal has been a true staple of classic rock and blues since the early 60s. The Wah sound is not limited just to blues and rock, it has been adapted by many other genres such as funk and even heavy metal. As if the guitar itself wasn't expressive enough, the CryBaby allows the player project more emotion and dynamics into their performance. The GCB-95 has a characteristic cutting high end, which allows guitar solos to slice through the band mix. This model includes the legendary Fasel inductor which creates the aggressive vintage sweep of the original 60s CryBaby's. This is the original - the one that created some of the most timeless sounds in rock. Relied on by Jimi Hendrix, Eric Clapton, Buddy Guy, David Gilmour, and many other greats. 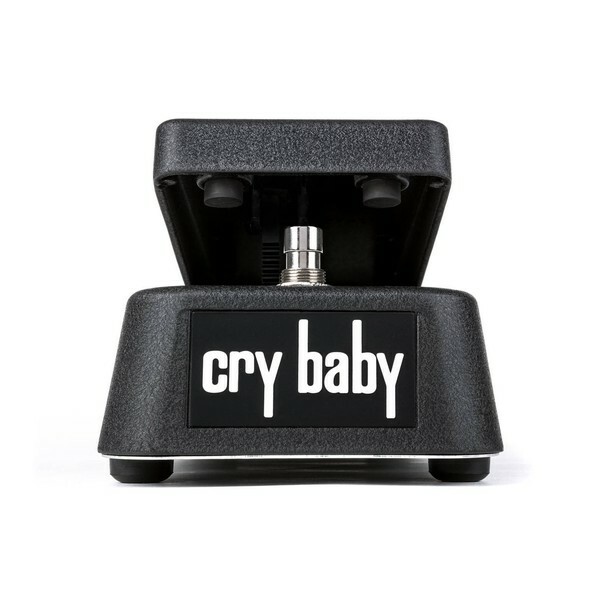 The Jim Dunlop GCB95 Original CryBaby Wah Wah pedal is a descendant of the original CryBaby Wah Wah pedal that has been a standard in the world of music since its introduction in the late 1960s. With a heavy die-cast construction chassis that has stood the test of time for reliability and an 100K ohm Hot Potz potentiometer that allows for that quick, abrupt wah sound. Legendary Fasel® inductor for vintage sweep. Aggressive sound with precise high end. Easily accessible battery door for 9V Battery.